The Brit Boost proved to be a very versatile pedal and whether running at the correct tube plate voltage or not (something for the tech geeks to decide), it had a very pronounced analogue quality that sat very well at any setting. Compared to some other overdrive offerings it is a bit costly, but considering the range of sounds , tonal options, metal housing and true bypass it is definitely a winner in my book. The Vox Cooltron Brit Boost is a true bypass overdrive/pedal booster with one 12ax7 preamp tube. The unit comes in solid brushed metal housing that looks like it could withstand some serious stage work. The tube is housed in a vented panel in the front and it could be seen glowing when in operation. 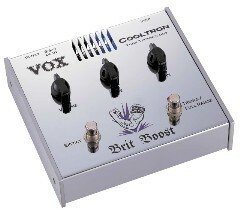 The Vox Cooltron Brit Boost has two switches - the one to the left labeled "Effect" turns the unit on/off while the one on the right switches between the Treble/Full Range modes. The Brit Boost has 3 traditional style Vox chickenhead pots, labelled Volume, Tone and Gain. The pedal has a 1/4 mono input and output on the front panel and can be powered via a 9V adapter (not supplied) or 4 AA batteries (battery life of approximately 20 hrs). According to Vox the Cooltron technology is their new patent, allowing preamp tubes to run at lower voltage and even be powered by batteries (in this case 9 volts) and provide all the tube goodness found in tube designs that require higher voltage to excite the tube properly. The Vox Cooltron Brit Boost is an overdrive/treble booster and naturally my first inclination was to try it through a Vox Vox AC50CPH tube amp and a humbucker equipped guitar (PRS Tremonti SE) and see what it could do. I powered the unit with 4 AA batteries as I didn't have the 9v adapter, which has to be purchased separately. I set the amp at a brit. crunch setting via its traditional channel and then dialed in a low gain setting (about 10 o'clock), tone and volume at 2 o'clock. At a "Full Range" setting the sound was reminiscent of a Tubescreamer overdrive pedal but with more pronounced low end kick and a slightly creamier sound - I was met with a nice smooth high gain tone that was great for some high gain rhythm work that also retains some note definition. The sound cleaned up nicely when lowering the volume from the guitar's volume knob. Punching the "Treble" resulted in a slightly ruder and more controlled sound with the lows dropping off a bit and the whole attack becoming more pronounced. Leads cut through really well and the sustain and bite this setting provided helped along for a better overall tonality. I really kept going for a while at this setting as it was very close to an original Black Sabbath sound. Adding more gain to this setting got the sound in more modern metal territory with something akin to a Metallica lead and rhythm tones. The tone control was responsive and helped dial in a darker or bitier tone that responded well to the amp's tonality. I also tested the Brit Boost at a clean amp setting and it provided a smooth blues overdrive tones with a slight touch of grit and some hard rock crunch sounds at higher gain settings. I also tested it on a Peavey Valveking head and again it performed like a champ. If I have to take this head to head with the industry standard, the Ibanez Tube Screamer Overdrive Pro ($170 street), the Vox Cooltron CT03BT Brit Boost Pedal ($99 -$160 street) has it beat in every aspect - looks, tone, versatility.